We’ve got Wizard Of The Coast Brand Manager Drew Nolosco and Associate Communications Manager John Schork sat down in a room to answer YOUR questions! As asked in our specifically-labelled listener questions thread. Learn about Grimlock recursion, John’s sushi philosophy, and parasitism. 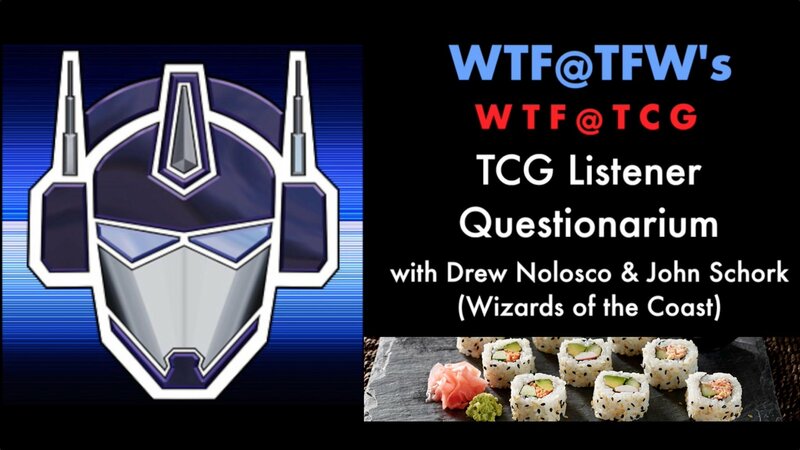 You can download and comment on it here: WTF@TFW – Episode 545 including a YouTube audio version. Later information has stated that it will be 1:50. I did see that and it does make that feel slightly less icky. I admit, especially now that it’s confirmed we’re getting more than 2 super rares, I’m bummed you didn’t ask any questions pertaining to that rarity, including my own. Still, was a great conversation. I still wonder if they were just revealing Windblade with placeholder art from the Legends game. The Windblade we got is the one they revealed, they just decided to use her SDCC outfit since she is the anti-combiner. Nope, that was new art. We've got Drew Nolosco and John Schork sat down in a room to answer YOUR questions! As asked in our specifically-labelled listener questions thread. Learn about Grimlock recursion, John's sushi philosophy, and parasitism.